The inaugural Nor-Cal Bus Fest was a complete success, with an excellent turnout for a first-time event. One hundred forty-seven (that's no typo 147) buses and trucks of all years, models and descriptions, made the drive to the fairgrounds in Vallejo on August 19th, 2007. Type II's ranging from pre-March of 1955 Barndoors (there were 7) to Vanagons, and everything in between turned out for this get-together. Todd "Bus Farmer" Olmstead brought several vehicles from his collection and led a caravan from Sacramento that rolled in 34 buses and trucks strong, which was quite a sight to see. Greg from Vintage Warehouse brought a handful of his rare special models out for everyone to enjoy. Several other collectors were able to round up drivers and bring out multiple vehicles of their own...thank you all for supporting this event! There were a total of three hundred ninety-four enthuisasts in attendance, and over 100 raffle prizes were given away thanks to our generous event sponsors. Sponsors included Izz's Safari Windows, West Coast Metric, Wolfsburg West, Vintage Parts Inc, Bugformance Stockton, Buggy House of Hayward, Vintage Warehouse, Kombi Haus, Peninsula Automotive, Mid-America Motorworks, Airhead Parts, Wolfgang International and Hot VWs Magazine. Thank you all. While there was no formal judging, a few "Best Of" awards were given out and the winners are listed below. Best Stock: Richard and Michelle Stewart, Paradise, CA. 1954 RHD Deluxe. Best Camper: Jesse Luna, Oakland, CA. 1960 Westfalia. Best Custom: Marc McGuire, Patterson, CA. 1962 Double Cab. Long Distance Award: Dave Potts, Reno NV. 220 miles one way. Thank you to everyone who attended the Bus Fest, special thanks to Todd O,Tony D and Greg B for rallying the troops. A very special thanks to the event crew who made it all run smoothly... Marilee, Al, Tony, Gen and Tom. Microbuses, Trucks, Campers and even an Ambulance courtesy of Thom. Tree-shaded lawns, sunshine, good friends and Type II's...the way to spend a Sunday! Another angle of Bus Fest. Clean, lowered trucks and buses were everywhere. Bus Farmer Todd Olmstead poses with his clean 15 Window Deluxe. Thank you for getting the Sacramento bus folks to come out! Dave got his recently-acquired Barndoor running the night before the show. Looks great Dave! This was one of 7 Barndoor (March 1955 and older buses) at the event. Richard and Michelle's mostly original '54 RHD Deluxe won the original class. Pictures do not do this bus justice. Todd's clean 15 Window and Dean's slammed Highroof. More of Todd Olmstead's fleet, Barndoor Panel and Single Cab. Jesse Luna's Oakland-based 1960 Westfalia won the Best Camper Award. The Disco Bus, owned by Kombi Haus. Look at that paint detail! Jeff Horn's clean 1971 Westfalia won the Late Model award. Dave Potts and his wife won the long-distance award by driving 220 miles in their bus from Reno. 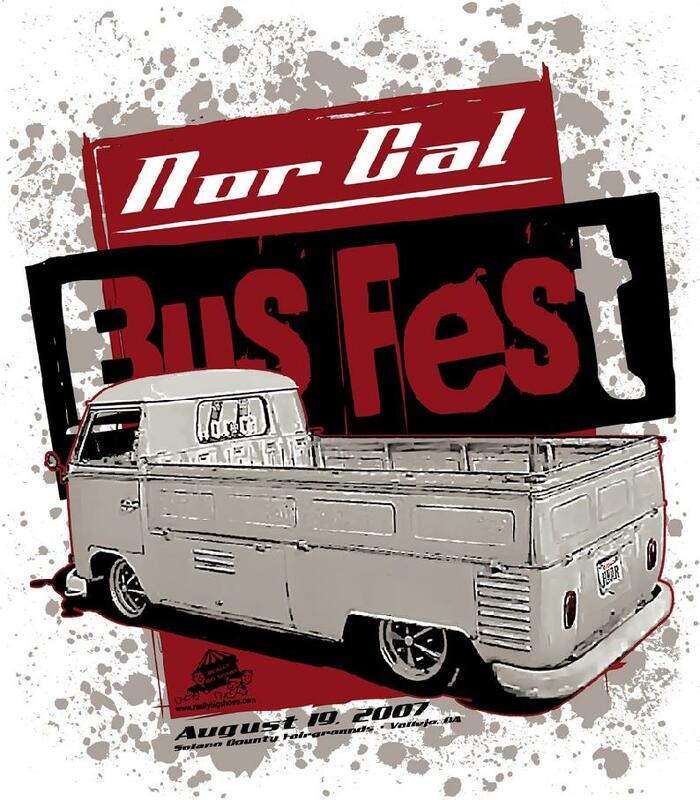 Rumors are already flying about buses driving from the northwest and So-Cal for May 2008's Nor-Cal Bus Fest 2! Beautiful Sealing Wax Red Kombi that showed up in the late morning.